Here's a list of a few of our special application First Aid kits, either created for specific customers or to address certain market requirements. Click the button below to browse through the list and have a look at anything that interests you! 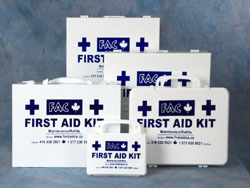 FAC First Aid is in the custom First Aid Kit business. In fact we're all about the custom business! We probably make more custom kits than anything else. Cost: especially when large quantities are needed, such as retail, promotional or fund-raising applications. We'll design and produce exactly the kit you need for your application, whatever the quantity, small or large. Let us surprise you with our quality, responsiveness and cost-effectiveness. Let's talk!